Lynda is a teacher by profession and runs a local writing group. 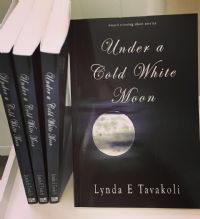 ‘Under a Cold White Moon’ is Lynda’s third book to be published, but the first short story collection. As well as being broadcast on Radio, Lynda’s short stories, poetry and prose have been included in a wide variety of publications earning her a string of literary successes. These include the Mencap short story competition, the Mail on Sunday novel competition and The Irish Times Henessey poet of the month in 2015.